Steve favors the type of misdirection for a palm where you openly do one thing and simultaneously palm a card (Mario dubbed this form the Action Palm). In this case he has combined the Swing Cut with a Gambler's Cop. 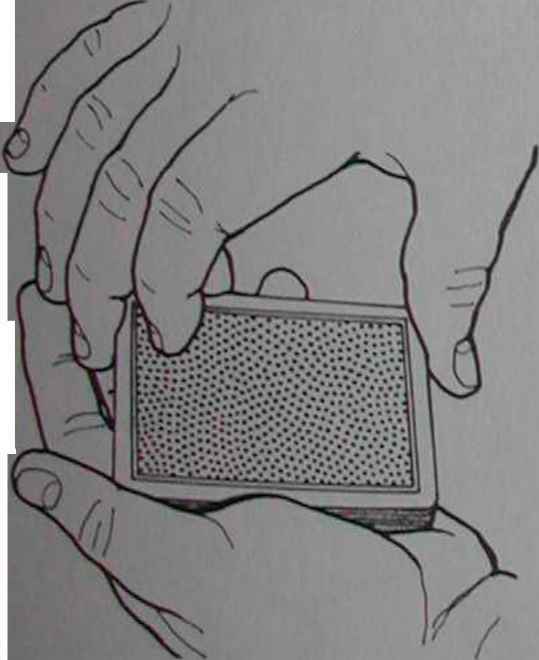 The deck begins face down in the left hand in dealing position. 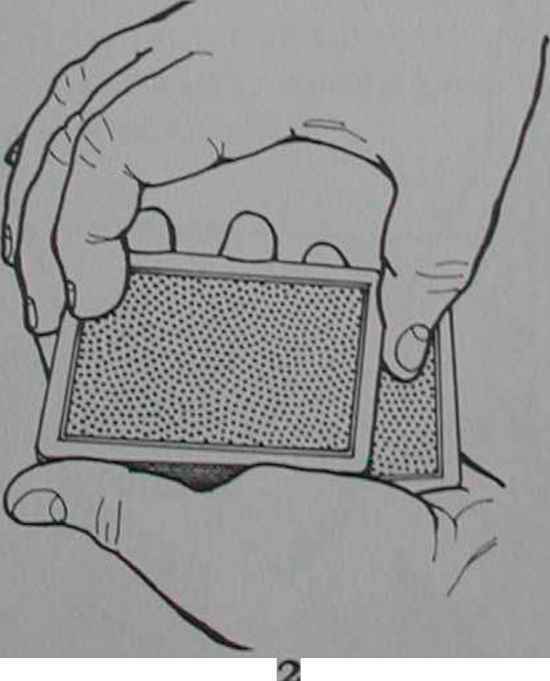 The card or cards which you want to palm are on the bottom of the deck, and you hold a left pinky break above them. The right hand grasps the deck in Biddle Grip and lifts it out of the left hand. 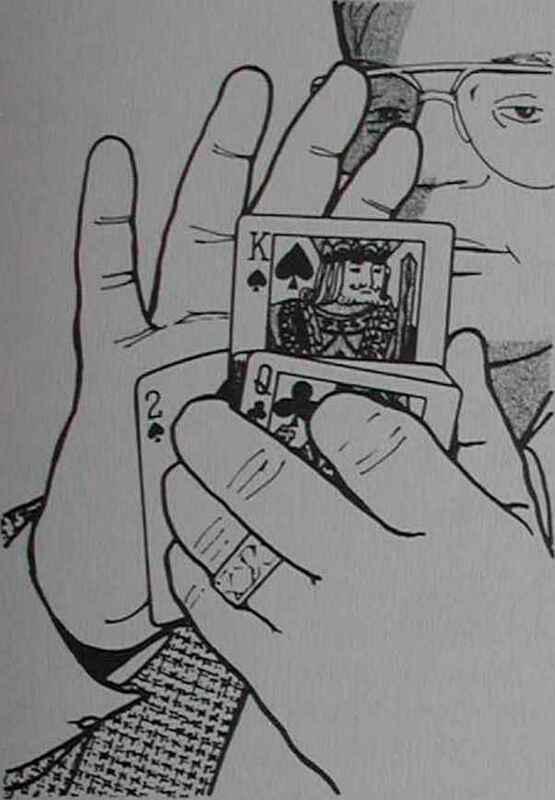 Some gesture is made, then the right hand lowers the deck back into the left hand, but well inward of the normal position, so the cards below the break are situated in Gambler's Cop (fig. 1). 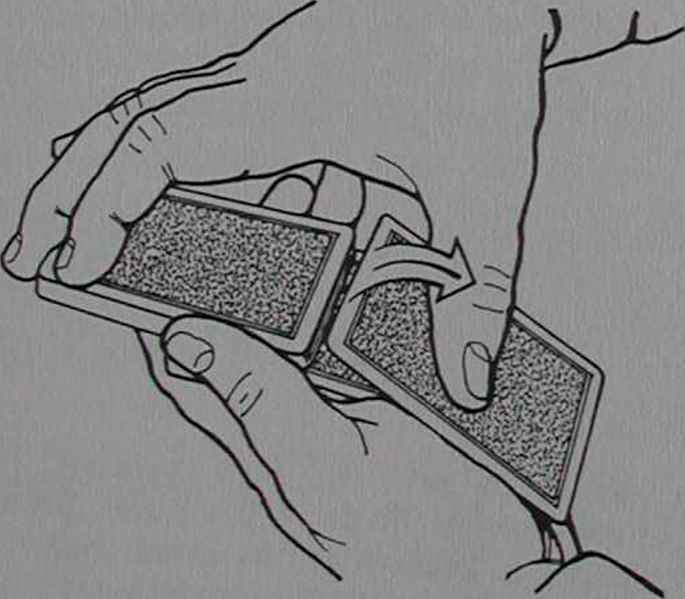 Leaving the cards below the break where they are, the right hand immediately shifts the rest of the deck forward into a normal dealing position (fig.2). 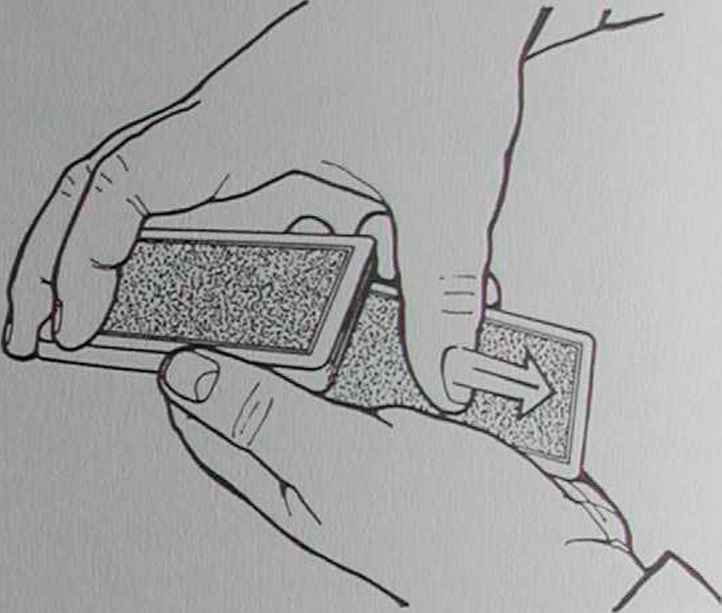 Then, the right first finger lifts a group of cards at the outer end of the deck and cuts it to the left, into the left thumb crotch (fig.3). In the action of pushing the outjogged card into the deck, the top card will be stolen into rear palm in the right hand. 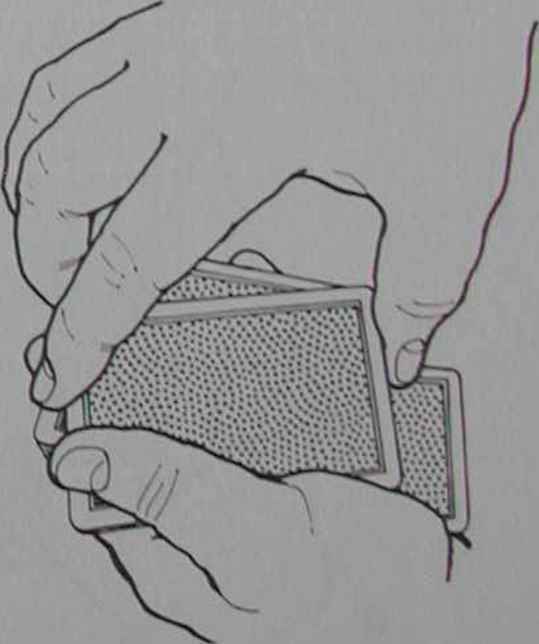 The palm-down right hand descends over the deck so the base of the right pinky contacts the top card of the deck at its outer right comer (fig. 1, in which the right hand is transparent). 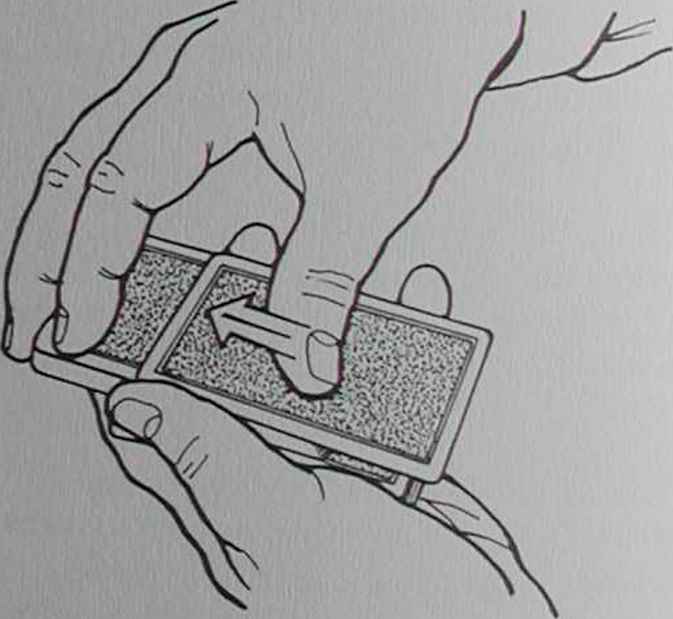 With light downward pressure, the right hand glides directly to the right, sliding the top card of the deck beneath it (fig.2, in which the right hand is transparent). (fig.5 is an exposed view). The right hand now moves away from thc deck, fingers spread wide apart (lig.6 is an exposed view). The rear palm is one of the most deceptive and least utilized of ¡ill the palms in card magic. It allows you to keep the fingers and thumb spread far apart, yet almost completely conceal the card in the hand. A slightly tacky hand is required—those who have hands which are dry as a bone will find this impossible to do. 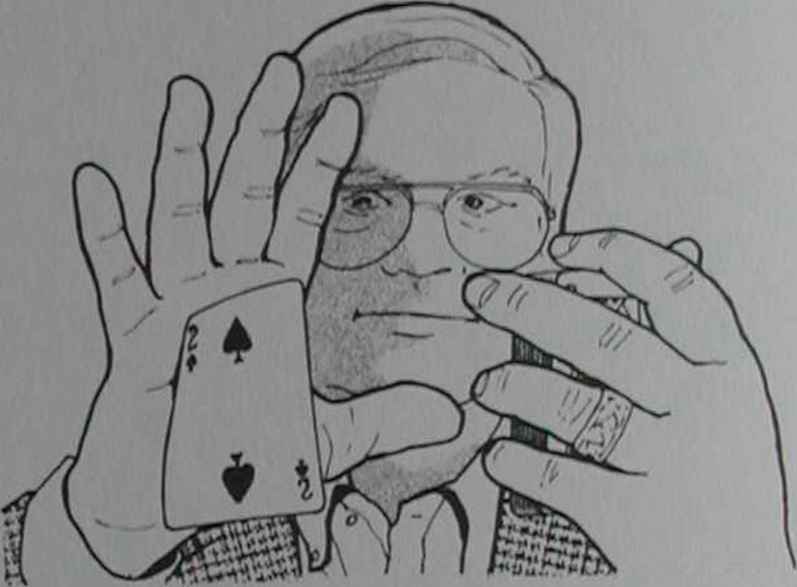 The only part of the card which is visible when it is palmed in this manner is the inner left corner, which can be seen just beside the wrist by someone standing on your extreme left. Otherwise, it is covered from all angles. Steve uses this sleight in his routine The Rubber-Band Card,' and the rear palm is utilized again in "The btarfish Change. In More Card Manipulations No.3 (Hugard, 1940) a sleight titled "The Thumb Slide-is prefaced by the following historical information. 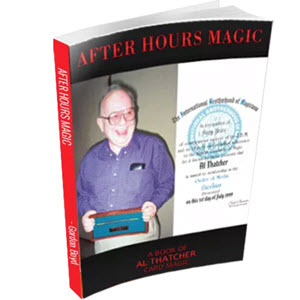 "This method of controlling a card after its return to the packet was, I believe, first described by Professor Hoffman many years ago in a footnote in Selbit's magazine 'The Wizard.' He credited it to Hartz, The Devil of a Hat Man. The sleight does not appear to have found its way into any of the textbooks or to have come into general use . . . ." Joseph Hartz died in 1903, making the sleight almost a hundred years old. Very few people have experimented with the move since that time. This is not difficult to understand since, on the surface, it seems to be extremely awkward and dreadfully angly, not to mention difficult to do. Steve Draun has spent many years perfecting a handling of this sleight, which may be considered an early form of the Side Steal done from the inner end of the deck rather than the side, and has developed a technique which is completely invisible and relatively simple to do. 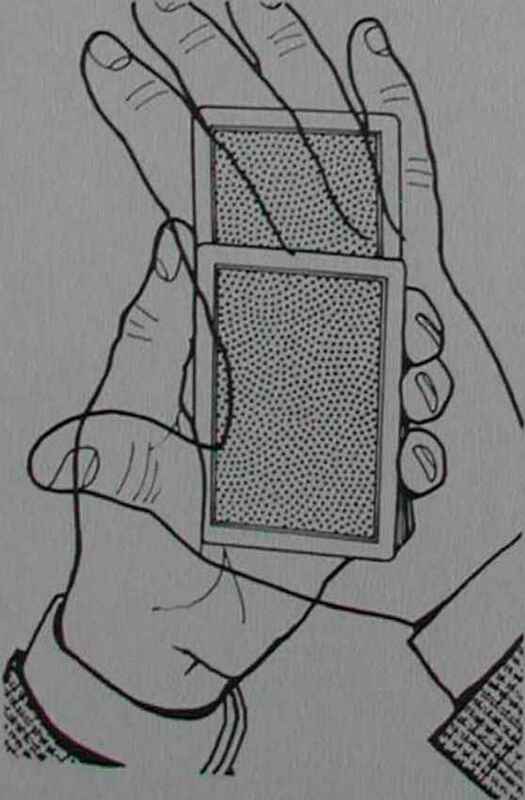 The face-down deck begins in dealing position in the left hand. Your right hand grasps the deck in Biddle Grip and lifts it out of the left hand. Ask the spectator to say stop" as you begin dribbling cards back onto your left palm. 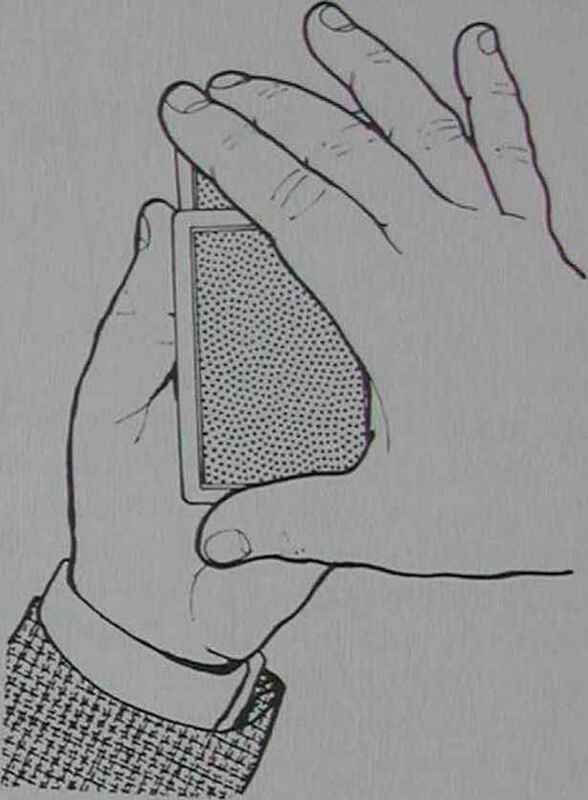 When "stopped," extend your left hand toward the spectator in a gesture that tells him to look at the top card. The cards remaining in the hand are not squared. After a moment or two, extend your left hand and have the card replaced. 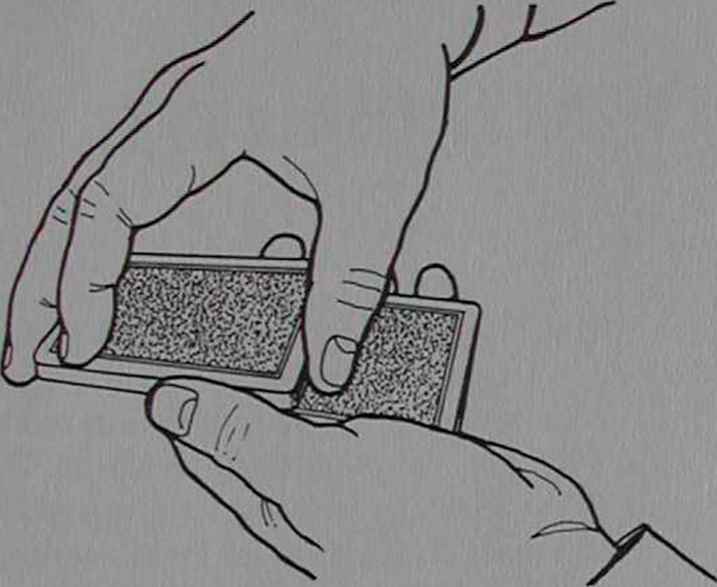 It should land in an unsquared condition, enabling you to obtain a left pinky break beneath it as the cards are squared. Lower the cards in your right hand over those in your left hand so that the tip of your right thumb (which naturally hangs below the lowermost card) touches the center of the card on top of the lower half of the deck (%1). The instant the halves touch, your left thumb and second finger firmly grip the "iner end of the upper half of the deck between them. The portions of the halves which overlap are not firmly pressed together. 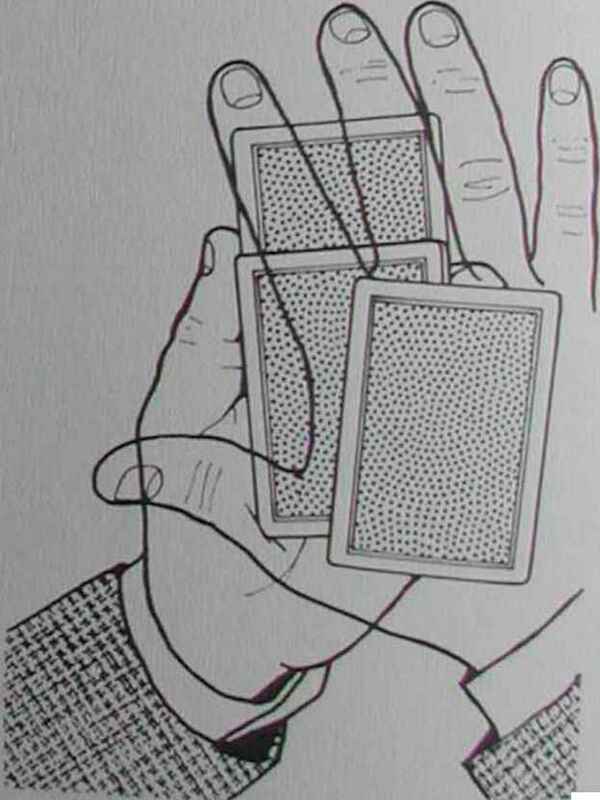 The left thumb and second finger keep tbe upper half elevated an" infinitesimal amount—just enough to eliminate pressure °n the top card of the lower half. The selected card is now isolated between the halves. While your right hand remains exactly where it is. and the fingers remain perfectly still, the thumb slides the £P card of the lower half inward until its outer end just clears the upper ha^ifig^ ^sh the card just a bit farther until the right thumb begins to pass overdieimier of the lower half of the deck, and the change in balance will cause the chosen card's outer end to tip up like a teeter-totter (fig-3). neatly direcdy over the lower half.